It is the disease of the sealed brood and is caused by a spore-forming bacterium Paenibacillus larvae. Adult bees are not affected by the bacterium. However, adult worker bees unintentionally favor the spread of the disease, as they feed contaminated honey (honey with spores of AFB) to young larvae. Contrary to a healthy colony, where the brood cells are continuous and have a bright yellow-brown color, infected colonies have mixed capped and uncapped cells, some of which are discolored. 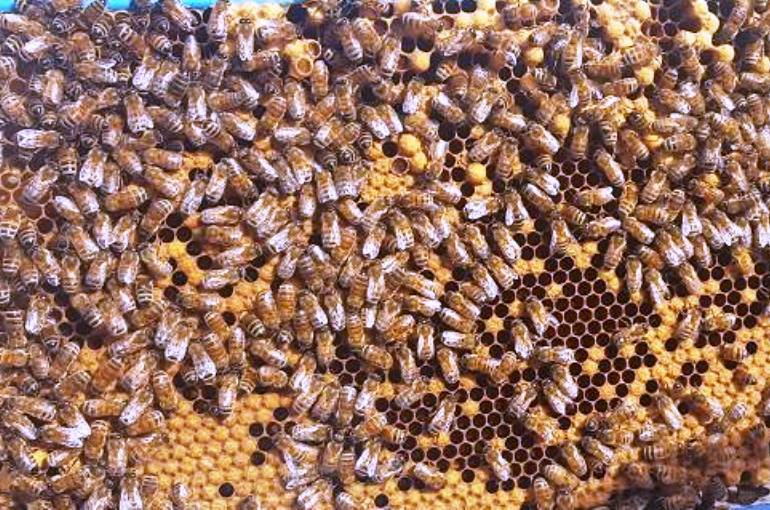 New beekeepers often do not have the experience to diagnose AFB, and they often unintentionally help the spread of the disease by interchanging infected frames to healthy colonies, during their colony’s split efforts. Thus, for once again, being accompanied by experienced beekeepers during your first year hive inspection and colony split effort can save from a lot of trouble. Unfortunately, the spores of AFB can live for decades and they can be spread from hive to hive through the beekeepers tools and various equipment. European foulbrood is the disease of the unsealed brood, as most of the larvae dies before the cells are capped. It is caused by the bacterium, Melissococcus plutonis, which does not form spores as the bacterium Paenibacillus larvae. Hence, the pathogen is not as persistent as the one in AFB and infected colonies are rarely killed. However, the colony’s population (and hence honey production) can be greatly affected. Introducing a new queen in an infected colony can sometimes reduce the spread of the disease. Nozema is the most serious disease of the adult bees and affects the worker, the drones and may also affect the queen. It is caused by the protozoans Nosema apis and Nosema ceranae. The pathogens form spores, which the adult bees consume with food. Most of infected bees then suffer from severe dysentery and may defecate inside the hive, something that under normal condition would not happen at such a great extent. Defecation inside the hive favors the spread of the disease. Infected worker bees are severely weakened and cannot handle the heavy workload of the hive. Foraging bees are often exhausted and die before flying back to the hive. During and after the attack of Nosema apis and Nosema ceranae, we find dead bees in front of the hive, the bees crawl or are attached to the ground, there are traces of diarrhea outside or inside the cell and there is a population reduction.